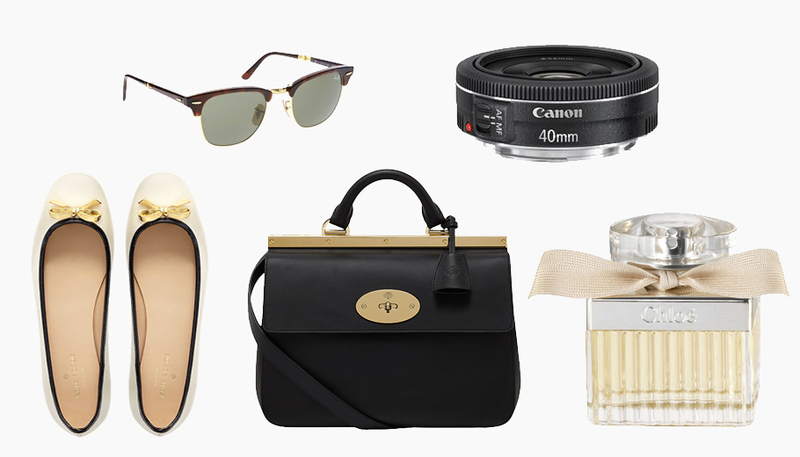 Today I thought I'd share with you some of the more expensive and 'out-of-my-league' items currently floating around on my wishlist. A girl can dream.. right? I dare you to not fall in love with these gorgeous Kate Spade 'Villa' flats. Kate Spade is one of my favourite brands (despite me not owning anything..!) but every product is so classy and right up my street. Some of the jewellery is slightly more easy on the bank account, so I'm considering treating myself to one of the pendants or bangles soon, as I feel I'm slightly lacking in the jewellery department! And how could I possibly write this post without including a Mulberry bag? They are simply beautiful, I have nothing more to say. Now this product isn't too pricey, in fact it stands as a rather averagely priced perfume, but sadly I can't really justify paying that much for it at the moment as I already have a few, so onto the list it goes. Chloé Eau De Parfum (£57.50) is one that brings back a lot of memories for me - running through the perfume section of Debenhams with my friend named Chloe many years ago - this was her go-to, for obvious reasons, but it's actually a really delightful smell, and always makes me think of the past. After having recently purchased myself a Canon DSLR as a reward for a very busy period of working over Christmas, I've started to look into other lenses I'd like to try. My previous DSLR was a little old, but the lenses were fine - but they all went on eBay. Sure, my 18-55mm kit lens does the job fine, but oh how I miss them! I've had my eye on this little 40mm Pancake lens for a while now (either that or a 50mm), and I'm hoping I'm able to save up for one and give it a go! And last but not least, these lovely Ray-Ban Clubmaster Sunglasses. I haven't actually decided on the actual style I like - but working in an opticians has it's advantages! I'll keep trying a few of the different styles, and once I get my discount (1 month to go!) I'll be picking up a pair for sure, for a price that's a little more easy to justify. Oh those shoes, that bag, that perfume! I want it all. But I really want those shoes. Lovely post! That bag is gorgeous, one day I will purchase myself a Mulberry! Gorgeous picks, I have my eye one the lens! Those sunnies are amazing! I've been restraining myself from buying Ray-Bans for so long, I don't think I would be able to handle spending that much money on a pair of sunglasses. Beautiful choices! The Mulberry bag is to die for! I would love a pair of Ray-Bans, they are just classic! I'm always daydreaming about owning Mulberry, one day!